If you're asking yourself, "What's a personal brand?" I would define it as a product or business that is tied directly to a person - their experience, their character, their attitude, and their thought-leadership in a particular arena. Think of celebrities, politicians, speakers, experts, and other public voices as personal brands. If you're not asking yourself, skip the last bit and keep reading. There were many thoughts shared in their candid conversation that resounded with me, but one idea in particular that struck a chord was that of legacy - looking forward, not just five or ten years down the road, but 25 years into the future. For me, that would put me at the ripe old age of 64. I can't seem to get Paul McCartney out of my head for some strange reason! How do I want my life to look when I'm 64? How do I want my career to look? What do I hope to have achieved? Who will I have served and in what way? How will people view me? Those are some pretty deep, thought-provoking questions for a food blog, I know! Yet, when you consider the type of business I am operating, Cookin' with Kibby is a personal brand, which means that much of what I do in marketing my product to you is an attempt to allow you to get to know me as a person. "Chef Kibby" is not an alter-ego or a facade I put on to fool the public; it's me. That being said, from the aspect of this personal brand, how do I hope people will describe Chef Kibby a quarter of a century from now? I want people to be able to say that I gave them something of value. I hope that there will be individuals, couples, families, and companies that are grateful for the impact I have had on their relationships and their lives. 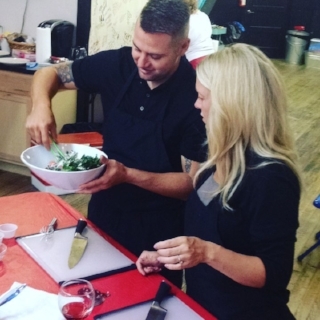 I want to be able to look back and see experiences I have created for people that have allowed them to feel more comfortable and confident in the kitchen. I want people to look back on their experiences in my kitchen with a sense of fondness and joy. I want to know that I have helped reverse the cycle, pushed back on the trend, so that more families are cooking nutritious food from scratch, spending time preparing meals together, and sitting down to eat and share their lives with one another. I want kids to have better relationships with their parents - biological, foster, or adoptive parents (of which I have been all three) - because they have put on aprons and shared time in the kitchen. I want the next generation to feel better equipped to menu plan, budget, shop, and prepare food for themselves and their families. Those are my hopes, dreams, visions, and aspirations for Cookin' with Kibby. Why am I telling them to you? Perhaps, in some way, I hope that this openness will provide me with a greater sense of motivation, knowing that I have no secrets here and that all of you will hold me accountable to these goals. Once it's on the Internet, there are no take-backs! and listening more to the people I serve to find new ways to make their lives better. I hope you take the time to listen to the podcast episode yourself, or at the very least ask yourself the same probing questions about your own personal legacy. Having a clear vision for how you want your future to look can go a long way to guiding your decisions today. If you wish to leave a comment, I invite you to join the conversation on my Facebook page.